March 27,2006: It took me a while to choose just the right girl for Leyden to continue my Blue/Pearl Merle line. I made the decision to breed Tuppins with my sweetest, best PR boy. Tuppins' name was derived with the Cockney language in mind so her kids would be named by the same way. 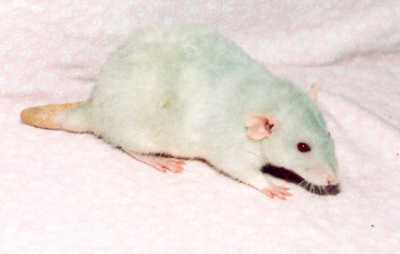 April 17,2006: Today is Tuppins' due date if they mated on the first day, but there is no sign of pregnancy. April 20,2006: Tuppin's is now looking pregnant. I set her up in a maternity cage, and put Leyden back with his boys. Tuppins' doesn't want a cagemate. I tried Dotti, and then Sindi, but Tuppins scrapped with both of them. April 23,2006 10:00pm: I've been really busy this weekend with dog agility and I didn't spend a lot of time with the rats. There are blood spots in the bedding of Tuppins' cage, but she does not appear to be in labour. Except for a lot of back leg stretching she looks comfortable. April 24,2006 11:00am: Now there are brown splotches in the bedding. Still no signs of labour. I saved the bedding in a ziplock bag and cleaned out Tuppins' cage so I could check for more signs of vaginal discharge. Pyometra? There's no foul odor to the discharge. I started Tuppin's on Amoxycillin. April 25,2006 10:35am: Tuppin's gave birth to two still-born babies. She still doesn't look like she under duress but I am now in panic mode. This is Pyometra, I know it is, and I know that surgery is our only course of action. But who will do the surgery? 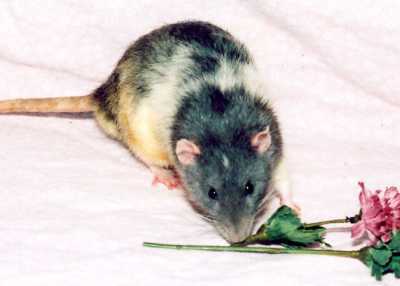 I have been estranged from my vet clinic when it comes to the care of my rats. I have no choice, Tuppins' life is in my hands. She might die on the table, but I guess I have to take that chance. I phoned my vet to discuss possibilities. One vet won't do the surgery because "his hands are too big". Another vet won't do it unless she does some research first to "see if the procedure can be done on a rat". This is a first for her and she is not confident that she can do the surgery. I told her about the info at ratguide.com. I got a phone call at around 3:00pm to bring Tuppins' in. So options were discussed. An X-ray was taken to see if there were any more babies inside her. There was one baby, more then likely dead. If she had given birth to all of her babies then the vet would have sent us home with antibiotics. But with a dead baby still there, surgery is a must. I left Tuppins in their care and came home to worry myself sick. I went to pick up Tuppins the next morning and to help her get through her post-op care. The vet bill came to $188.39 which includes x-ray, analgesics, the cost of a feline spay, and post-op meds, including an injection of metacam for pain. I already had Baytril and was told to give this her for 7 days. June 03,2006: Tuppins had appeared to fully recover from her surgery, but weeks later she developed a severe head-tilt due to Myco. The bodies of Tuppins' babies did not come home for cremation. I am amazed at this vet's surgical skill, and neatness to her surgery. This vet, our Angel, saved Tuppins' life. All I wanted was a litter from one of my most beautiful, gentle, squishy girls, SBR Tuppins and my equally gorgeous, gentle, outstanding, Ratty PR boy, SPAZ Leyden. It took me a looooooooooong time to find the right girl for Leyden, and an equally loooooooooong time to think about breeding them. But "Tuppins' Cockney Kids" just wasn't meant to be :*(. Sunday Night, 11:00pm, April 23, everything started to go wrong. There was blood spotting in the bedding and Tuppins never went into labour. I never rushed to the vet because I still thought labour was imminant. Then there was the watered down brown liquid discharge that got heavier by Monday afternoon. Still no sign of labour, and now I'm thinking Pyrometra. Started doing research. THANK YOU KAREN FOR THAT ARTICLE ON PYROMETRA AT RAT GUIDE! You know you saved Tuppins life because I was able to find this article so quickly, and it was so thorough that it helped my vet as well. In the wee hours of Tuesday morning Tuppins gave birth to two very dead, full-term, babies. I found them in the bedding when I got up early to check on her. I immediately phoned the clinic at 9:00am to get Tuppins in for an emergency spay . But get this, one vet would not do the surgery because he felt his hands were too large, and the other vet had to do some research because she had never spayed a rat before, let alone a pregnant rat with pyrometra. Tuppins got her surgery at 3:00pm yesterday afternoon, after a thorough examination. I had no choice really. X-rays revealed that there was still one dead baby inside her. The option to induce labour was not a good option because in all likelihood her cervix was closed and she would be just pushing against a barrier. The process would further exhaust and weaken her to the point where she would no longer be a good candidate for surgery. So I hoped for the best and went with the spay. Nobody else has ever brought their rat in for this procedure. The rat would just be put to sleep instead. Tuppins survived the surgery. She survived the recouperation time by staying overnight at the clinic. She's home now, looking pretty darn good for what she has been through. Thumbs up to the surgeon, her assistants, and the compassion and respect for a rat, from the same clinic that I had/still have issues with since last October because they don't have any experience in the medical care of pet rats. I am exhausted :( How do you handle the stress and worry over a sick pet? Since Monday I haven't been able to eat because my stomach is in knots and even the smell of food cooking makes me want to throw up. So that leads to a sick headache that leaves me weak and shakey. I can't sleep because my active brain cells are congering up horrible senerios and I can' t stop praying. I can't concentrate on any single project for any length of time and so I wear a trench in the floor by pacing. Now that Tuppins is home.............all the symptoms of anxiety have melted away, and all I want to do is sleep beside my Tuppins, or watch her eat peas and blades of grass. In hind sight I realize she had stopped eating much of anything on Saturday. They shaved very little off her belly, and the incision is very small and clean. Metacam was given last night and this morning for pain, and she'll be on Baytril for awhile. Karen, they took pictures of the x-ray and surgery for me, just like what you see in Pyrometra article. Would you like me to add Tuppins case to Ratguide?